Just watched Biutiful – the story of a dying conman played by Javier Bardem. Set in a Barcelona that rarely graces our screens, dark and flawed, seering your emotions from high to low with wonderful intensity with Bardem at the centre, pulling you along through his dark life in a fractured city. Director Inarittu’s view of this Barcelona is more akin to the slums of South America than the picture perfect rose tint of Woody Allen who also took Bardem and Barcelona as his muse. I don’t know when I’ll next be in Barcelona, a city that always felt like a home, but I’ll certainly look at it with fresh eyes when I do. Surely the mark of a great film. Author Matt HobbsPosted on April 17, 2012 Categories MusingsTags Barcelona, film reviews, Movie, spainLeave a comment on It Is Biutiful..
A happy lunchtime find – Kemistry Gallery currently has a show on by the quirky Barcelona based Brosmind Studio, called Los Canotiers. The ‘Brosmind Army‘ comprises a number of limited edition ceramic characters, modelled after the terracotta army in China. Each ‘platoon’ consists of 50 characters and is named after their particular headgear, in this case the ceramic boater hat, or canotier, that each character wears. By rotating this hat, you rotate the face the soldier presents to one of three different expressions. The show is on until 31st July, and you can even purchase the handmade, limited edition sculptures. A pure white ceramic canotier, in a limited edition of 50, costs £290 each. For those of feeling a bit more flush you can go big, for one of the 9 platinum coated characters, priced at a cool £420. Very tempting. We’re just back from an impromptu short trip to Barcelona. Our plan for the week off had been looking round London areas to move to, but the Great British weather had other plans. So as a result of a hangover (good to see you, TIm) and easyJet we went from getting up at 10am with no plans to being in lovely, warm Barcelona at 7pm. Splendid. Barcelona was wonderfully relaxing. Eating great tapas at Set de Born in the evenings. Walking along the beach in the sun. Slow, languorous breakfasts at Kasparo. Comfy designer chic at the Soho hotel. Getting lost in the old city. Perfectly perfect. We even enjoyed our virgin easyJet experience – something I’d been dreading with some of the stories you hear. Now we have some easyJet ‘tricks’: do internet check-in to get on the plane quicker to choose your seat, their unlimited weight carry-on policy means you only need to pre-buy a single hold allowance if you want to buy wine, and bring some food, books & other entertainment. That and the check-in at Barcelona airport is miles away from the main T2 building (at sector C), which in itself is confusing to get to from T1 (you have to go downstairs to level zero to get a connecting bus) – but the BCN aerobus is cheap and quick. 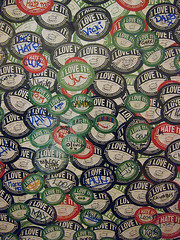 Barcelona photos will be uploaded soon(ish), especially as Lightroom now has a release candidate that supports the wonderful Canon S90, but in the meantime enjoy this wall of stickers from the pop-up Marmite shop on Regent Street. Mmm… marmite.